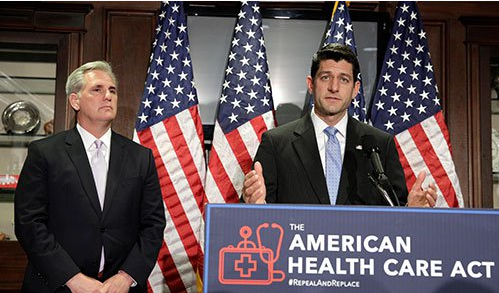 The American HealthCare Act, introduced in the House of Representatives on Monday, begins the process of looking for a replacement and improvement to the Affordable Care Act. It moves in the right direction but also has some major shortcomings. The Bill discards the ACAs web of mandates and regulations in favor of incentives to buy health insurance in a deregulated market. The Bill replaces the ACA exchanges with refundable tax credits for individuals not covered by employer provided health insurance. There is no upper limit on the tax exemption for employer-paid premiums. This tax exemption amounts to a total drain of nearly $300 billion a year on U.S. tax revenues and is the biggest single reason why healthcare is so expensive in the U.S. The inadequacy of financial support for the lowest income individuals and families. A $2000 annual tax credit for a minimum wage worker is simply not enough for her/him to be able to afford health insurance. This huge discrepancy between the lavish tax treatment of employer-paid care and stingy tax credits for individuals is a matter of fundamental inequity as well as unsound tax policy. It would be much fairer to give all Americans the same equal tax credit roughly equivalent to the cost of catastrophic healthcare insurance. Conclusion. The ACA increases access to healthcare insurance but does nothing to control costs. It is imperative for the Republican replacement plan to fix this glaring deficiency. This entry was posted in ACA, Affordable Care Act, health care, health care spending, health insurance, healthcare reform, House of Representatives, Jack Heidel, Wall Street Journal and tagged health care, health care inflation, healthcare reform, House of Representatives, jack heidel, Wall Street Journal by jackheidel. Bookmark the permalink.